Prime Minister Narendra Modi’s adoption of the Asiatic Lion as the symbol of “Make in India” has triggered off a debate. The lion — Gujarat’s state animal till now — has become ubiquitous. The brilliant, public brand developer, Amitabh Kant has made the lion near synonymous with Incredible India, as Dalda once was for ghee (clarified fat). The lion now appears in tri-colour ruffles; bedecked with flowers; impaled by pistons, wheels and gears; outlined in bright LED lights or most elegantly just in a steely grey profile. The message is clear — India is not a power you can mess with. 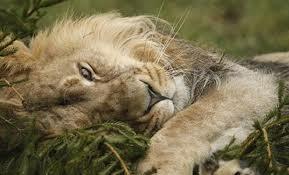 Of course, the truth about the lion — but not the lioness — is that it is the laziest big cat ever. It uses its overpowering muscle mass and speed to forage for food; overeats voraciously and then sleeps contentedly barely able to control its snoring. But just the sight of its mane; its magnificent rock cut nose and jawline; its arrogant gaze and its tawny coat can bring on the goosebumps, absorbing the viewer for hours on end. The lion is not king without a reason. In comparison, the Bengal Tiger — India’s national animal — is a furtive large cat which slinks about in the dense undergrowth. Whilst magnificently graceful and elegantly clad in striking stripes, it relies on strategy and guile in making its kill. Lions are more transparent. They hunt in a pride and can even take down an elephant. The tiger is a solitary hunter and can even be done in by a pack of wild dogs. Which of the two suits India’s image best? Today’s “muscular” India is closer to the lion than the tiger. For the longest time, through the 1970s, ’80s and till the 1997 financial crisis, East Asia was known for its fast growing “Tiger economies” — tightly managed, efficient, lithe and opportunistic. India is far from that model. We are too big to emulate the East Asian steps or use the entry points available to them — FDI in electronics and automobiles from Japan and later China and external trade drive growth. We are too diverse to have a single model fit all requirements. The “Pride of Lions” model suits us best — group effort; selection of the fittest amongst the group to lead and a strategy which leverages our size and inherent strength rather than rely on our low levels of flexibility or the accompanying moderate speed. Valmik Thapar — India’s best-known Tiger conservationist — suggests that adopting the elephant suits India best. In fact, the elephant is the state animal of three Indian states — Kerala, Karnataka and Jharkhand. But elephants can’t dance, jump or dunk. They do have prodigious memories and are very community minded. Elephants will mourn a dead member of the herd for considerable periods and are very human in their reactions to loss and their fondness for a drink when the Mahua fruit ripens. But its ponderous pace reminds us of the bad old days of the Hindu rate of economic growth. Its high maintenance — a daily feed of 140 kg and water consumption of 120 litres is the kind of resource intensity we need to get away from. Its proclivity for making false charges and trumpeting to scare off the enemy is too close to the regressive character of our political discourse today. Its unfortunate tendency to defecate in large quantities at inconvenient locations is so similar to the India we are already used to, that it just cannot become a symbol of what we want to be. I suspect even Mr Thapar would agree. In fact, most likely, his apparent willingness to forego the “national animal” status for the Tiger — his first love, in favour of the elephant, seems to be a red herring — a canny move to propose a substitute so impossible, that it can mire action in discussions for the next decade, thereby maintaining the status quo, which suits Mr Thapar best. This tactic is familiar to every well-trained bureaucrat and part of her arsenal of tactics for blocking change. But move away from the tiger we must. Here are three key reasons for doing so. First, we would thereby enable its adoption by West Bengal, which currently has to make do with the unglamorous “fishing cat” as its state animal. This is unbecoming for a state where the mighty Sunderbans Tigers prowl. Also, Bengalis in India can never digest the fact that Bangladesh has unfairly appropriated the Royal Bengal Tiger as its national animal leaving them with just a cat. The recent Communist governments in West Bengal never bothered about this because for them all cats are the same. In any case, in the “man versus wildlife” debate, they are squarely on the side of man. Prior to them, the Congress government was a mere handmaiden of the Union government. Didi (chief minister, Mamata Banerjee) now needs to right this wrong. Second, despite being the national animal and thereby enjoying the VVIP special security arrangements of Union government-funded tiger reserves, the tiger population in India has not stabilised. In contrast, Mr Thapar notes, the lion population in Gujarat has increased, thanks primarily to the proactive conservation efforts of the state government. The lesson is clear. If the tiger is to be saved, name it as the state animal of West Bengal, Uttar Pradesh, Madhya Pradesh and Rajasthan so that state governments develop a direct stake in its conservation. Third, the question of naming the Indian elephant as our national animal does not arise. It is a beautiful animal and we don’t want to lose it by elevating it to this status. But if the “national tag” is the kiss of death, what hope is there for the Asiatic Lion to survive its de facto national status? Here we have to pray that the “Lion” that we have as the Prime Minister, currently, will look after his own, just as he did in Gujarat. In case Mr Modi does not deliver, we could always switch to naming rodents as our national animal and at least be done with them forever. PreviousIndo-German Defence Pact- New beginnings for subaltern states.